Christmas is coming, and I'm so happy to welcome you to my home! 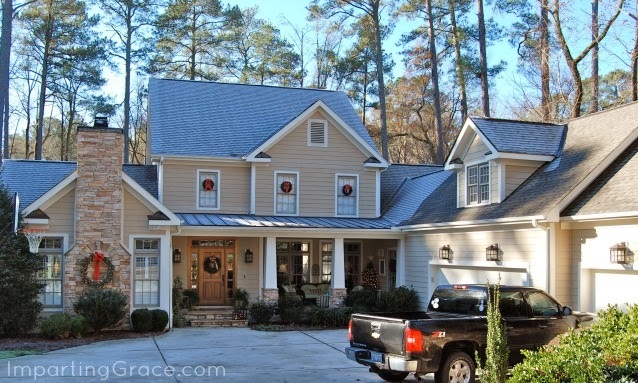 You'll have to forgive me for the black pickup truck in the photo of our house. I'm happy it's there, because it means that my 20-year-old son Preston is home from college. Come on up to the porch. Last week, it was so warm that you could have lingered here! But today it's cold, so come on in. You'll find that our home this year is a celebration of all things traditional. This will be the first Christmas in 23 years that our oldest son, Will, is not with us at Christmastime. He's working in East Asia this year, so I'm feeling nostalgic for all things that remind me of Will at Christmastime. This year the foyer is the spot for our Christmas village. It's a small collection of the Dickens village by Department 56. When my boys were small, I put the village under the Christmas tree with a Lionel train circling it. How the boys loved that train! The village is special now mostly because it brings back memories of those Christmases past. The village is magical at night when it's all lit up. Of course, lighted houses means lots of electrical cords, so I massed poinsettias under the table to hide most of the mess. Off the foyer is Jack's library, which this year holds just a few Christmas touches. My favorite thing here is the Christmas cactus. Isn't it lovely? Hard to beat the work of the Master Designer! 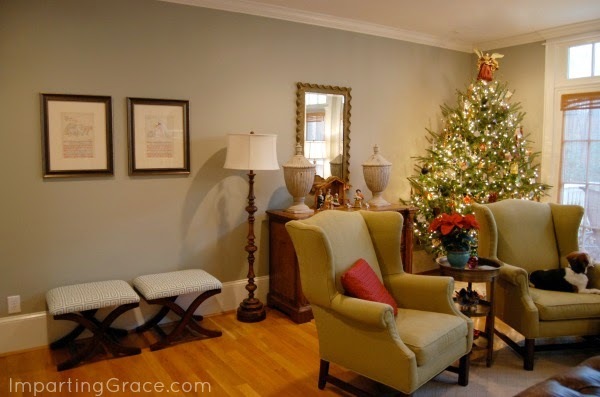 The reading chair in the corner holds one of my super-easy DIY Christmas pillows. My favorite things in this room are the antique Santa mugs. My grandmother had a huge collection of these mugs. 20 years ago, my mom suggested that she give one mug to each of her great-grandchildren. My boys called my mom "Grandmother" and my grandmother "Great." My mom and my grandmother both died in 1999, so I really treasure the fact that my mom wrote the boys' names, the date, and "Great" on the bottom of the mugs. On the other side of the foyer is the blue dining room, which is lovely at Christmastime. On the sideboard are three plates from Lenox's "Trees Around the World" series--one from each of the years my boys were born. My centerpiece this year is a boxwood wreath around a silver bowl of ornaments. Simple but festive! The windows in this room are untreated, so it's fun to hang ornaments in them. Both the dining room and the foyer connect to the living room. We re-did our living room this year, so this is the first Christmas with the new decor. The far corner of the room is where we always put our big tree. On the other side of the room, I hung some illuminated sheet music that I framed myself. On the chest beside the tree is one of our Nativity scenes. It's just an inexpensive porcelain set, but it's special to us because this is its 20th Christmas in our house. Our tree is not fancy--it's a live North Carolina Frasier fir, and it holds ornaments we've collected over the years. 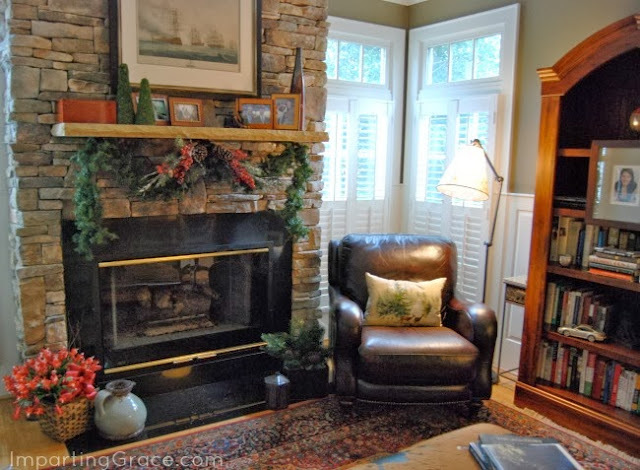 This is the fireplace where we'll gather on Christmas morning, so here's where our stockings are hung. 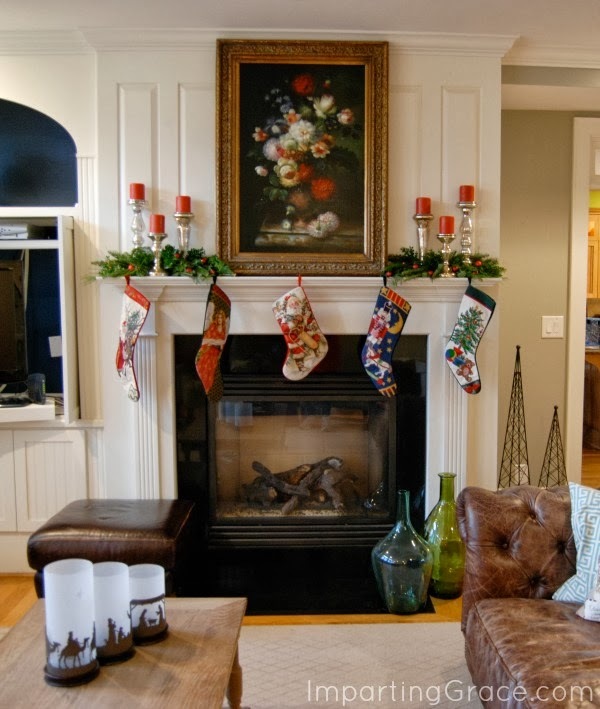 I kept the mantel really simple this year, allowing the stockings to take center stage. Will's stocking is in the middle. His was the first one I bought, back in 1991. We'll have to Skype him in on Christmas morning! 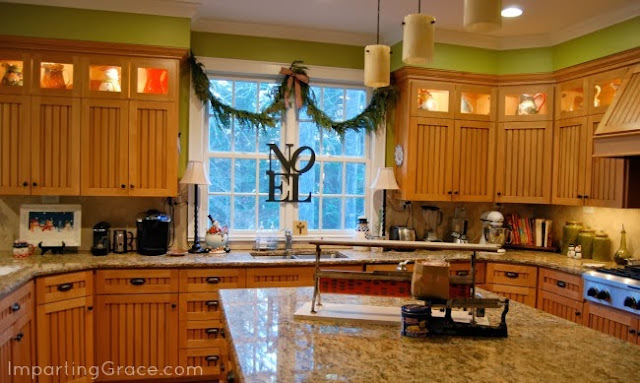 The living room and dining room both lead to the kitchen, which is enjoying a Christmas look, too. Every year I remove the DIY faux Roman shade from my kitchen window and put up a garland. 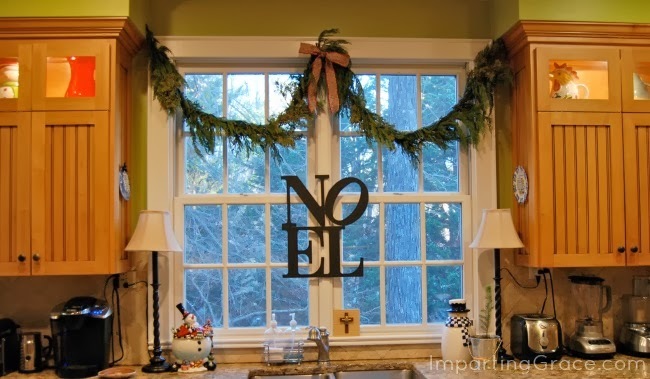 I also hang my DIY "Noel" sign in the kitchen window. I see from this photo that my bow is a bit crooked! The island holds a couple of fun antique store finds: a vintage wrapping paper roll from a general store and an antique scale. At Christmastime I put a bag of candy on the scale. 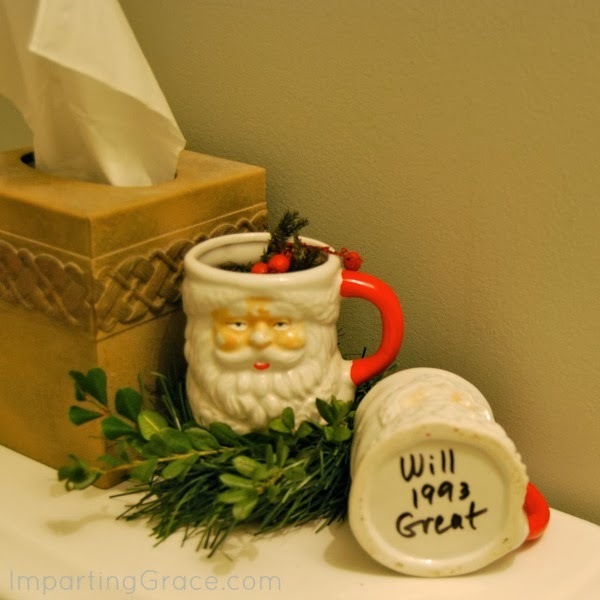 Jack added a tin of his childhood favorite, King Leo peppermint sticks. The wrapping paper cutter really works! It had Christmas wrapping paper in it when I found it an antique store. Our eating table is 11 feet long, and it gets used daily for everything from eating to homework to Lego-building. A fancy centerpiece here would be in the way. 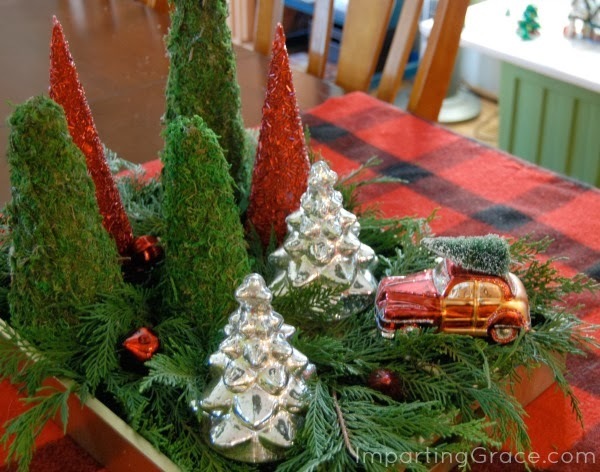 I simply draped a buffalo plaid blanket across the table and created an arrangement of small Christmas trees on a tray. This is easy to scoot aside when necessary. 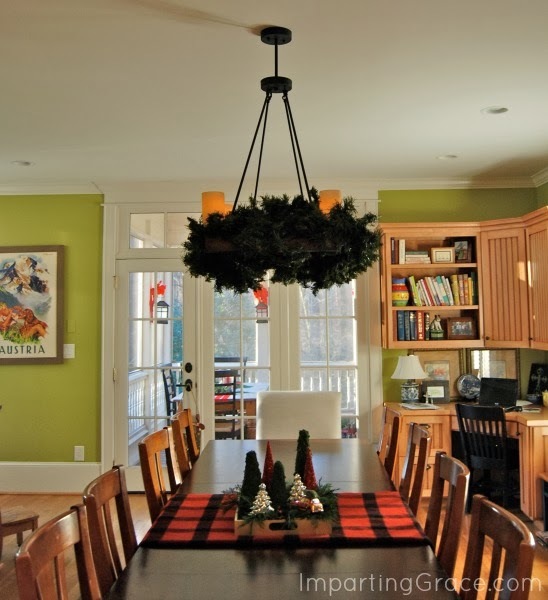 Above the table, I wrapped garland around the chandelier for a woodsy Christmas touch. This table holds the world's simplest table runner: three lengths of red ribbon. I just use my staple gun to attach the ribbon to the underside of the table. This year I added a bit of garland and a couple of red candles in glass hurricanes. 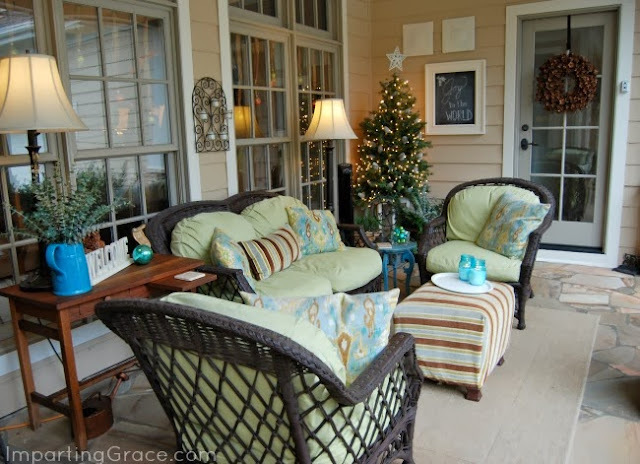 The seating area gets some Christmas cheer, too--just a few things that don't mind being outside. Now all we need is some snow! Thank you so much for visiting my Christmas home. I hope you'll agree with me that "traditional" doesn't have to mean "boring"! How are the holiday decorations going at your house? I'm joining the Colorful Christmas party at Inspired by Charm, Wow Us Wednesday at Savvy Southern Style and the Christmas home tour parties at Jennifer Rizzo, Kelly's Korner, and Nesting Place. 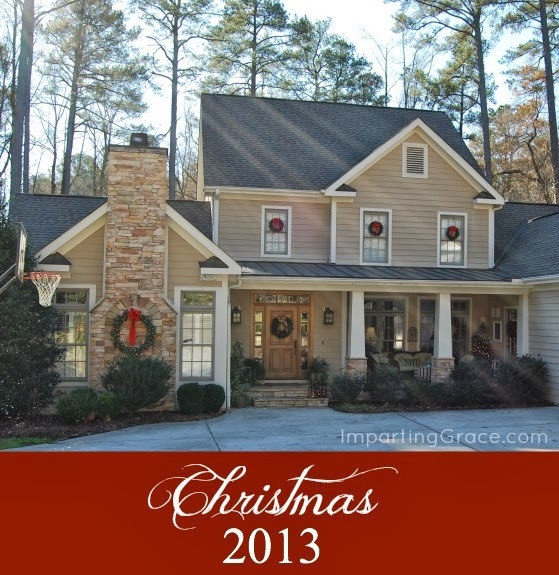 Your house is so pretty and I really love all the Christmas touches. 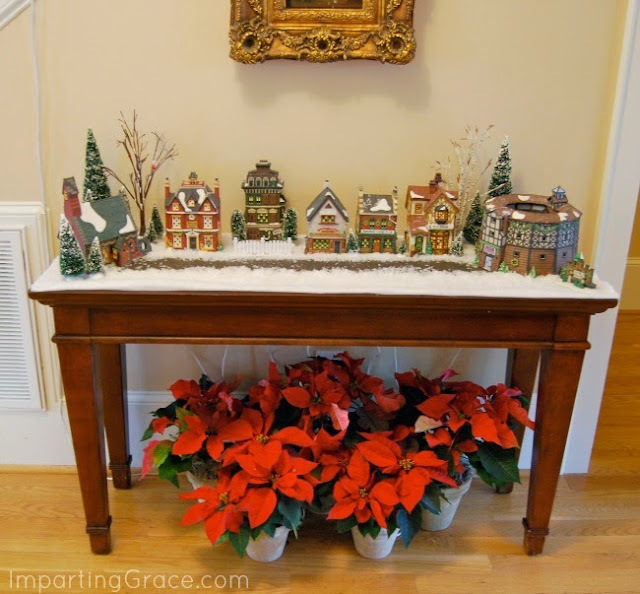 I have thought about starting a Christmas village because I love how they look and great idea with poinsettia hiding the cords. Ahh so beautiful I am ready to come over for a come of hot chocolate. Gorgeous! I love the outside and inside of your house. The wooden floors and the big windows. All nicely done up for Christmas. Your house is beautiful! So cozy! Love your home! Absolutely love your screened in porch. BTW, those leather couches--to die for! Your home is absolutely beautiful!! I love all the simple and natural touches. Gorgeous! As always, you home looks so pretty decorated for Christmas. I love the story behind your Santa mugs and know that you boys will treasure them always. The blue balls in the centerpiece on your dining table really bring out the wall color. I love that thoughtful touch! I hope you enjoy every moment of this special month. Your home is just lovely! I would share some of our snow, if possible. We have quite a covering of it here in Missouri. 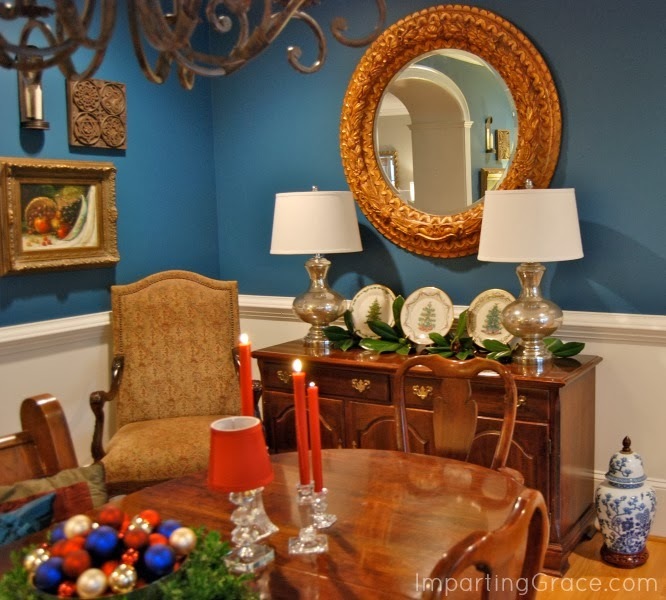 Richella, you have captured the Christmas spirit so beautifully in your home! 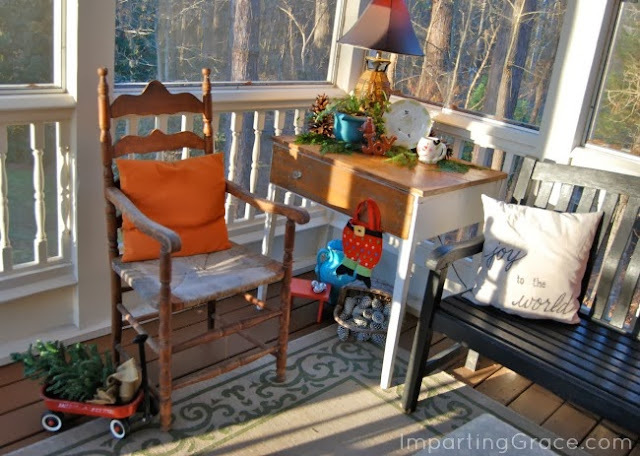 From the front porch, all the way through, your holiday touches are just lovely! Both your home and your Christmas decor are beautiful. The sentimental touches make it even more lovely. It looks as cozy as ever, Richella! I'm sure you will miss Will and that he'll miss you guys ever more! Absolutely LOVELY!! I love your home Richella! Such an inviting space. I can imagine many warm memories being made here. I love every single thing about your home Richella! 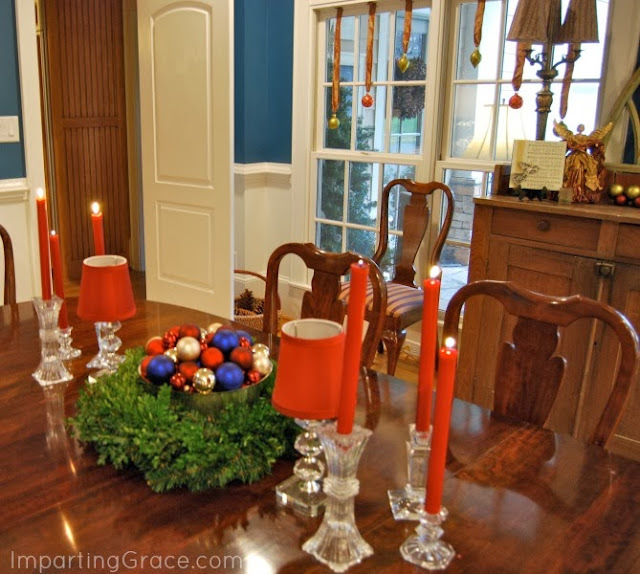 I especially love all of these Christmas touches you have added to make it even more inviting! I hope it will be a wonderful Christmas...and I hope you won't be too sad about your oldest not being there. He is always close at heart...and I am sure he will be thinking of all of you! Love your home, Richella, and how you decorate. That placemat pillow idea is fantastic - thank you! You should come link your post with us for our Holiday Pink Saturday. We would love to have you join us. Everything is so lovely. I am sure your son will be missing you as much as you are him! Happy Holidays. I don't think that traditional is boring at all. I have toured some homes. They are beautiful but I enjoy red and green. I saw a lot of swags and greenery, and a lot of silver and white. Although it all looked stuning. I will never change my green and red traditional décor. Your home is beautiful, and your Christmas décor is too. It all looks wonderful Richella. It's always hard that first Christmas when things change. Somehow, we think it will go on forever ~ Have a very Merry Christmas. Your home is lovely, Richella! My favorite decorations are the ones that have been with us year after year, too! A beautiful home inside and out! Holiday greetings to you Richella, I love your home and your decorations are similar to many of mine; in fact, I have the same stockings you do for my girls. I am traditional too and love the touches from years past. Next year we may have a new place to decorate and it will be so fun. May your days be merry and bright. I am in LOVE with your house! What a wonderful home tour too. I am just sitting here in amazement at your house though. It's magnificent! I live on Long Island and the houses around here pale in comparison. Teeny tiny and no wooded areas. I have to show my husband! Lovely, magazine lovely. You have such a gift, Richella! Richella...what a beautiful place to call home. I love the simple yet elegant touches. And my oh my...what a great idea with those poinsettias!! Thanks for the tour! beautiful!! 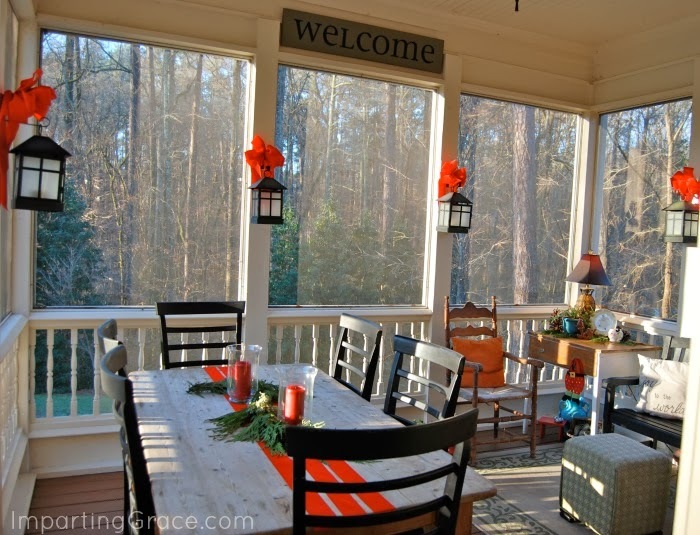 love love love your screened in porch! Oh, I love everything! 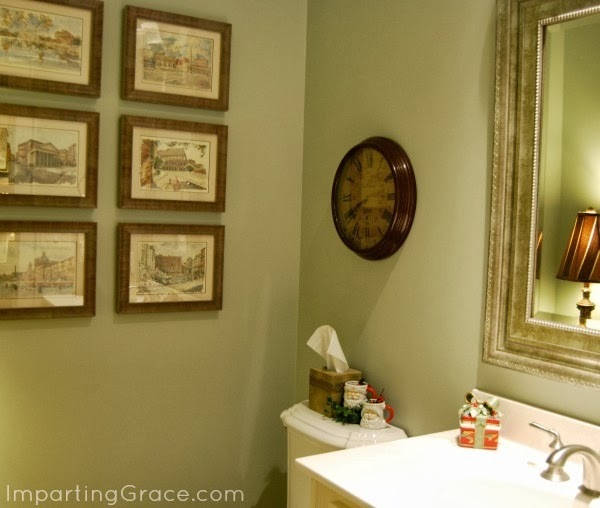 I love how you can see the tree from the foyer, the antique scale and the wrapping paper roll in your kitchen. I love all of your beautiful touches! It is a feast for the eyes!! 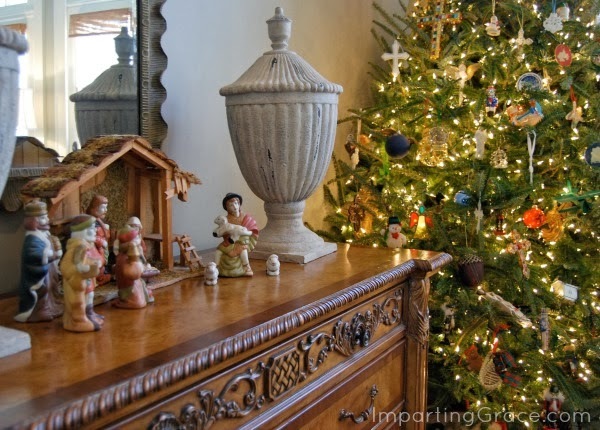 You have such a gorgeous home and how beautiful it is for Christmas…from the moment you approach your house to the front porch and I am sure when friends and family enter they must gasp from the beauty within…love all the beautiful details. Merry Christmas to you and your family! Richella, your home looks lovely. I like the idea of a paper cutter. Only yesterday I was wrapping gifts and trying to mastermind my mini paper cutter, that didn't work, so I just used scissors. I think I'll be getting myself a bigger paper cutter for next Christmas, it would save a lot of time. Your home is lovely, Richella. I am sad that you will be missing Will, but am so thankful for skype. It kept us feeling so together when our daughter was in England for 2 years. 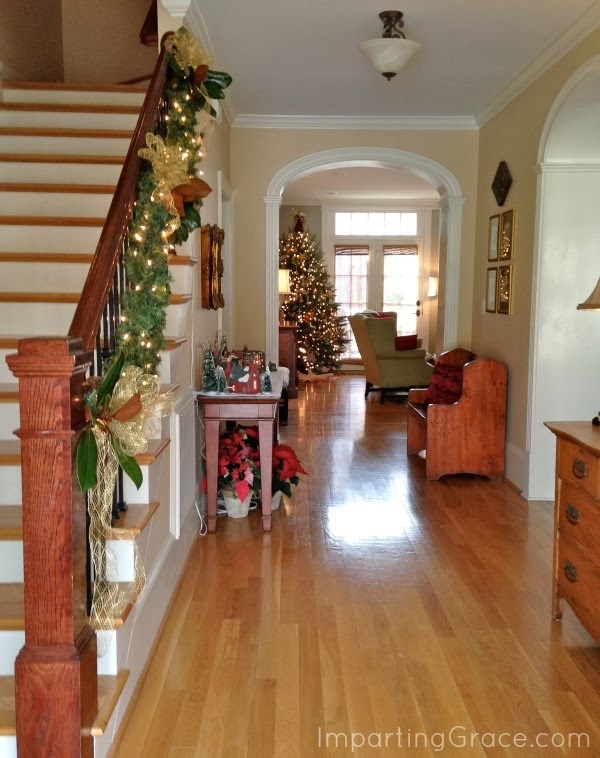 Richella, your home is just lovely all decked out for Christmas! Love the Christmas tree on the porch. HI Richella! 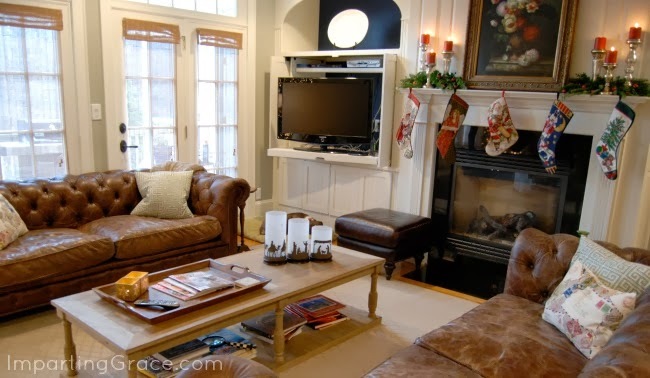 Oh, your home is just so lovely and you've decorated it beautifully for Christmas! I thoroughly enjoyed my tour! Hope you're doing well. Your home is lovely. And the exterior...just wow. I always love seeing all those wreaths on the window each year! And nothing says Christmas like a home full of your loved ones. Hope you are enjoying this time with your family home! Very beautiful! I'm all about traditional! Love it! WOW. Your traditional isn't the least bit boring! I LOVE your home. IT is elegant, warm and cozy! Merry Christmas to you and your family. Oh, those Santa mugs are SO precious. It's been a long time since my last visit - I really like what you've done - everything looks beautiful! Do you have a tutorial on your "NOEL" on the kitchen window? I'm curious how you attached the letters together. Thanks! Thank you for inviting us into your home! It is absolutely Beautiful! 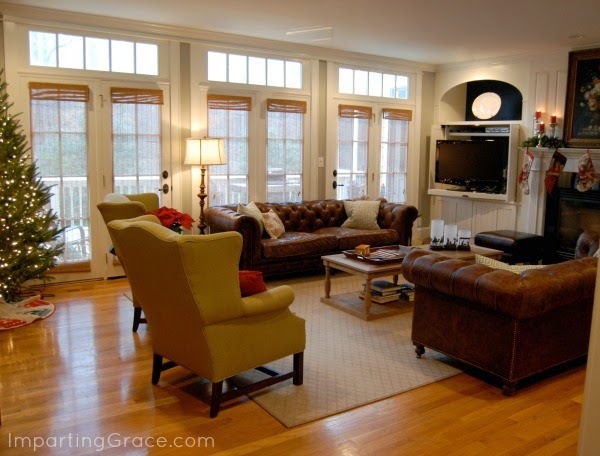 I really enjoyed looking at your beautiful home, thank you for sharing. My kids are growing up on me, too, and I share your desire for getting back to traditions and remembering fondly the times we've shared together. Have a very merry Christmas! Your home is filled with such beautiful and thoughtful touches Richella! Isn't it wonderful to have skype so that you can still stay in touch with your son on Christmas (and other times)? Simply lovely!! I've noticed many of us went traditional this year. A sign of the times, I think... 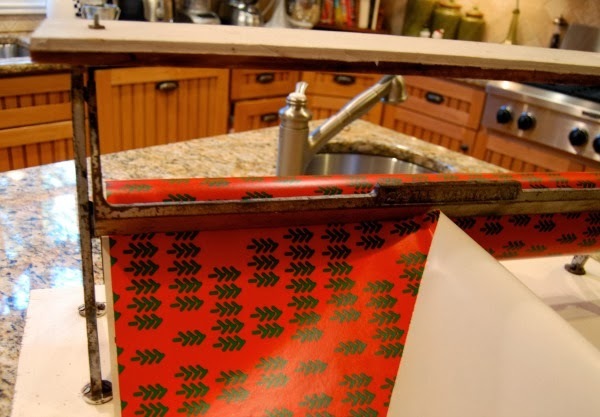 I love it all, but am fascinated by your gift wrap cutter! How awesome is that? And practical too!! Merry Christmas! It's all beautiful, Richella. Have a very Merry Christmas! Very nice, this will be your warm haven, and habitat of the soul. I'm a little late for Christmas, but I thought your home tour was lovely. So warm & cozy & just about perfect! I hope Will is enjoying his time working abroad!